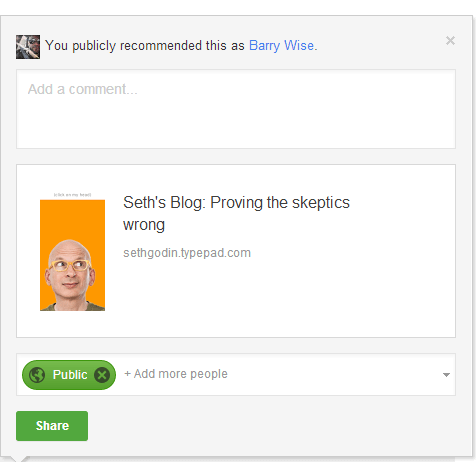 For example, take a look at the latest blog post from Seth Godin (Obviously a legend in the biz and I am by no means targeting him!). You’ll notice that if you click the Google+ button, it just pulls in the title and the first image it finds on the page (his face). It doesn’t seem like that’s going to get a lot of re-shares and +1’s does it? (Of course, it did, because he’s Seth Godin and he could put a picture of himself using an iPhone on the toilet and he’d get shares). Almost a great tool. Unfortunately I’ve tested it on pages where I know all the relevant data is there and this tool reports that it is not. When I double-check using Google’s own tester, it says the correct markup is in place. The same is true when I use Facebook’s Debugger to check og markup. So I’m left confused: Both Facebook and Google says the markup is correct, your tool says it isn’t. Not that I always believe everything either Google or Facebook says, but the results still leave me hanging. Excellent, great article. You are right, there seem s to be a lot of guesswork atm about seo. This is great information about markup data for the big social media platforms. Btw, that social media optimizer is a great tool. Although back links are an important aspect of search engine optimization (SEO), that’s not all that your team should be focused on. An updated study from Searchmetrics revealed how important social media signals are to a strong SEO ranking. According to the company, well-positioned URLs almost always have a high number of Likes, shares, tweets, and +1s. For Google authorship, there is one reason we can’t check it and one known bug. We can’t check sites that are verified via email, and don’t use authorship markup. Also, we have a bug we’re fixing with a syntax error – if you use alternate placement or syntax for the author markup we miss it. That will be fixed in version 2 coming out soon. I agree 100% that social media optimization is the new seo because social signals have become so crucial to a website’s rankings in the popular search engines of Google and Bing/Yahoo. I’m not too sure whether social signals affect rankings in the other search engines such as DuckDuckGo.com. This is a great tool to start with. As with SEO, getting 100% with this tool or any other tool doesn’t necessarily guarantee page 1 results or tons of traffic, but I feel much better know I’m at least on the right track. The tool is very helpful a first round at correcting signal issues and I’m very grateful found it in a Google search for “search engine optimization and social media.” Thank you, Barry! I have a bunch of articles online. When I added Google Authorship, I did see a small bump in traffic to a lot of those pages. I’m not saying it was all because of adding Authorship, but I’d like to think it was a contributor. So yeah, I agree, SMO is a big deal.